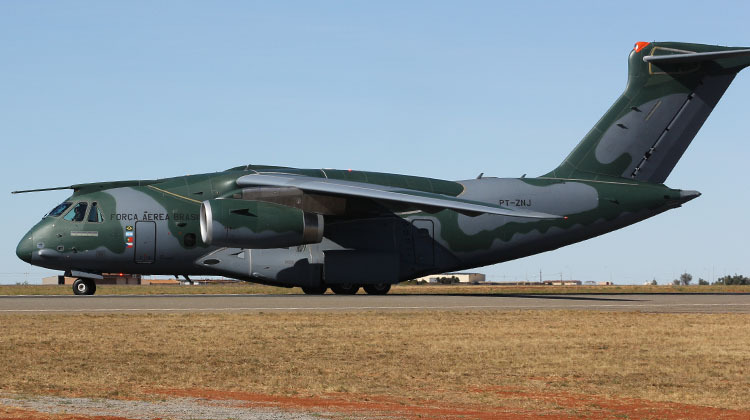 Embraer’s KC-390 airlifter has made a brief stop in Australia on its way to New Zealand as part of the aircraft’s 10-country demonstration tour. 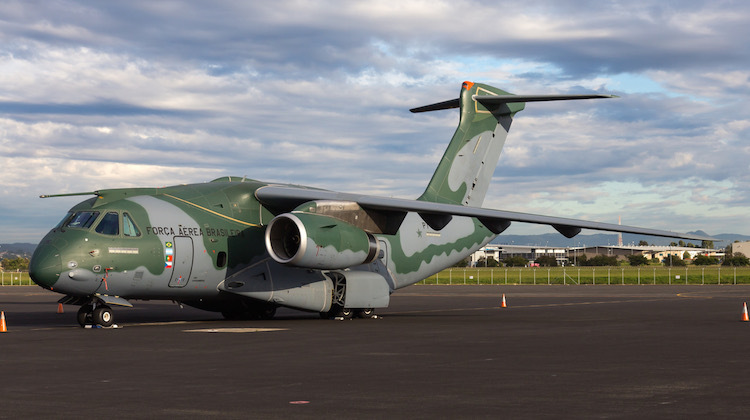 The Brazilian manufacturer is bringing the KC-390 to New Zealand in support of its bid for the Royal New Zealand Air Force’s future air mobility and future air surveillance capability requirements to replace the C-130H and P-3K2 Orion maritime surveillance aircraft. The KC-390 PT-ZNJ first touched down in Australia on Sunday afternoon at Port Hedland in Western Australia’s north west, having flown in from Kuala Lumpur. The aircraft was on the ground for about five and a half hours before flying to Brisbane. Schedules from flight tracking website Flight Aware showed PT-NZJ was due to depart for Auckland on Monday afternoon. In June, Embraer confirmed it was offering the KC-390 for the RNZAF’s airlift requirement but declined to say if it was offering the KC-390 or a variant of the E195 airliner for the maritime surveillance role. “We have solutions for both . . . and we decided to bid for both,” Embraer Defence & Security chief executive officer Jackson Schneider told Australian Aviation at the Paris Airshow. “In maritime patrol we can offer solutions with the KC-390 or even offer solutions with the E195. Both are very efficient platforms to meet maritime patrol needs,” Schneider said. But what mission system a maritime surveillance configured KC-390 or E195 would be fitted with Embraer won’t reveal. “How I address the need this is something I don’t want to [disclose] but I have the possibility to offer solutions with both platforms,” Schneider said. To date the two KC-390 development aircraft have flown about 1,000 flight hours. The Brazilian air force is due to receive the first of 28 KC-390s it has on order in early 2018, while Portugal has announced plans to order five. Although PT-ZNJ made stops in Port Hedland and Brisbane on its way to Auckland, Embraer is not demonstrating the KC-390 in Australia as part of the current tour, which in addition to New Zealand also covers Europe, the Middle East and South East Asia. “Embraer is not demonstrating the KC-390 in Australia as part of the current tour …”. Why would they when we have just taken delivery of six C-27J Spartans? They’re not entirely stupid! However, it would be a good option for Enzed to cover a multitude of platform requirements, given that they possibly can’t afford or justify larger types and/or multiple types for the various roles that this and the E195 could cover. Alan the KC-390 is more a competitor for the C-130 & A400 then the C-27J, with a max payload of 26t compared to 18t for the Herc & 10t for the Spartan. Australia’s current Tpt fleet is all under about 18yo so we won’t be looking for new tpt Aircraft now till about 2025+. Josh i don’t think the actual RFT has been released yet and won’t be for a couple of years. The future MPA is being done 1st. Well guys just been to Base Whenuapai to see the KC390 depart Auckland to Sydney, while waiting a C130H flew overhead and landed. They parked it just down from the KC390 & you can see how old the Airframe design is. When the KC390 took off it went straight up like a bat!…. very impressive and quite powerful . Looked to have more thrust than the average A320, but the lift from the hug wing clearly helps. Very futuristic looking aircraft. Appears they took Airforce & Govt officials for a 40min Test flight out into the Hauraki gulf, and back. Great little lifter, certainly useful for RNZAF Looks like a 2 holer BAe 146! This will be a good seller no doubt, just like the E170/190 types. Looks like a “Mini Me” version of the C-17 – minus two engines!! Nice design, though. It’s actually a lot bigger than it looks. Max TO weight 81t, Max Load 26t, C-130 70t & 20t, C-27J 30t & 11t. Puts in the Med airlifter class. It’s the cockpit windows that make it look smaller than it actually is, all it need are more orders. Looks like the 390 could do all 3 roles for NZDF. Great savings on training and logistics. Probably needs more countries to sign on first? Short field performance could be a problem if a direct herc replacement is needed? If only flying to good fields,maybe not a problem? Might be some questions about two engines to the ice? But two engined aircraft fly all over the world. My pick for the RNZAF on replacement of the C-130H, this could quite possibly get the nod over the C-130J. I hope two to three A400Ms replace the 757’s in 2023. C-130J is currently the hottest competitor for Air Mobility tactical airlift because of affinity with RNZAF upgraded C-130H operations and Base fitout. Not really useful for strategic airlift, while A400M can fulfil both tactical and strategic airlift roles. KC-390 has a better spec than C-130J, is this enough? For surveillance hard to go past P-8 Poseidon (FMS approval given recently, but no order yet) but keep an eye on Saab’s Global 6000 offering with smart sensors, ability to drop bombs or torpedoes and a much lower operating cost. Tactical airlifter decision will be required within the next 12 months as first aircraft is to be delivered by Feb 2020. Maybe Embraer will buy the business to get an Asia-Pacific order?